Fellow member Dar Isensee and I shared an animated discussion at the June meeting about our upcoming trips to Slovenia. 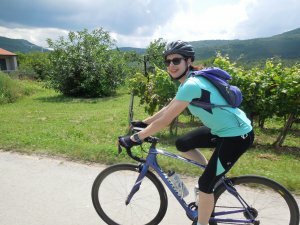 I planned to cycle the hills from Lubljana to Bled, then on Rohinj, Croatia. Dar was strategizing to find time to explore crystal clear chalk streams near the Julian Alps while treating his wife to a Balkan vacation. “I’m not bringing a rod,” I said, “because there will be either no time for fishing.” Fast forward to our first day cycling up to Bled. We crossed bridge after bridge over sparkling blue rivers and streams, their substrate so clear you could see the shadows of trout holding in soft water. That familiar yearning for rod and boots welled up with each crossing. Later that evening at Hotel Vila Bled (it was Tito’s vacation home during his reign), the next day’s “route rap” was disappointing. Rain was forecast for the entire day and our guides felt the 20% descents with occasional potholes would be too dangerous for cycling. They offered a day of hiking the lovely gorges and lakes in the area. Well, what about fishing? I began conspiring with two guests that I learned earlier in the day were fly fishers. 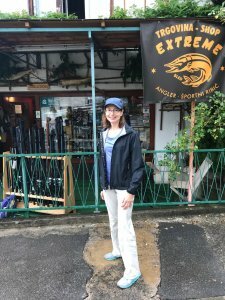 Mary loved fishing for stripers on the east coast close to home and Leon had experience fishing trout and salmon in Alaska. 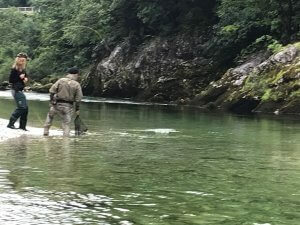 We convinced our cycling guides that epic fly fishing was close at hand and they set to work to see if we could ply the local waters on our “rain day.” We were delighted the next morning to be on our way to Extreme Angler – Sportni Ribic to get our gear and meet our fishing guide, Marko. Marko Gradnik is a middle-aged local who grew up exploring the famous rivers and small creeks of Slovenia. He has an international clientele, strong opinions about flies, and smokes like a chimney. 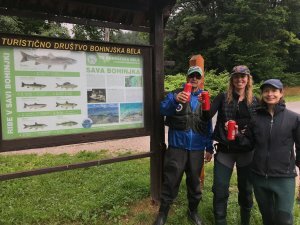 With neoprenes, secret flies, and 5 weigh rods in the car, we headed out to the Sava Bohinjka River. 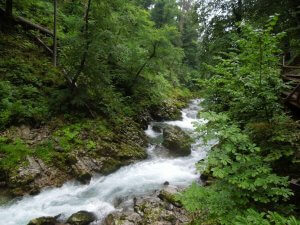 The Sava Bohinjka flows out of the picturesque Bohinj Lake in the Julian Alps. The alpine waters are cold and clean as they tumble down gorges and rush through meadows – the perfect home for trout. Slovenia has very strict fishing regulations to protect the resource. Fishing the Sava and its tributaries is restricted to a single fly, no longer than 5 cm, barbless hook, and no added weight. Strike indicators are allowed. Fishing from boats is not allowed. A one day catch are release license is $15 Euro less than a harvest license (I like that idea!). Marko set Leon up with a nymph to fish the fast water. He put me with dries and Mary was stripping back streamers. Marko said the gin clear water required 6X tippet. Hold on if you hook a big one! We all caught several fish in the first run. Browns and rainbows were plentiful and took dries and nymphs eagerly. The larger rainbows were more selective. 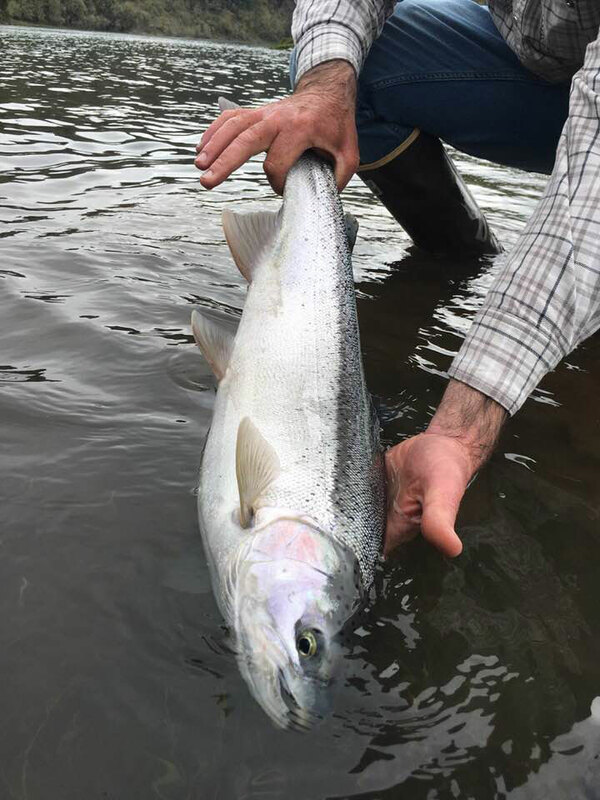 I enticed one steelhead-sized rainbow that followed a streamer twice but refused it at the last second! Grayling were more apt to take a streamer. Such a treat to catch the graceful grayling! But the big surprise was the monster Hucho hucho. What? Isn’t that the same genus as the Mongolian taimen? Indeed, they are cousins and the Slovenian Hucho, or Danube trout or Huchen, also spends its life cycle in the river. We had some shots at the Hucho and Mary’s amazing double haul brought her fly enticingly close to a behemoth below the a spillway. 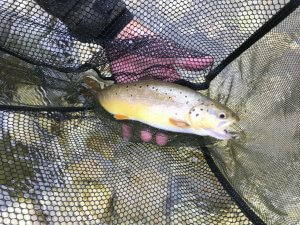 Alas there were no Hucho hookups but the end of the day brought many browns to the surface next to the tree-lined banks. 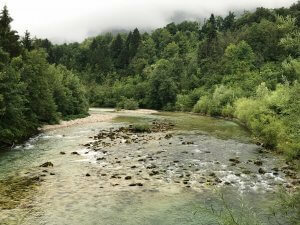 That evening at an interesting Bled restaurant, Garden Village, we dined on creative vegetable dishes set on live grass “placemats” while Mary, Leon, and I shared stories of our surprising opportunity to fish the Sava Bohinjka.